In Calxa Premier you can consolidate multiple organisations to display their combined Profit and Loss, Balance Sheet and Cashflow Forecast reports. This help note will guide you in running consolidated reports on multiple organisations. Most report template groups support consolidated organisation reporting however there are some exceptions. In order to consolidate multiple organisations you must first create or copy each organisation into the same Calxa Workspace. In the Organisation Management screen each organisation has a Consolidation Rate. This rate only applies to multiple organisation consolidations. When consolidating multiple organisations this rate will be applied to accounts within the organisation. The consolidation rate may be used to consolidate organisations with different currencies or to represent partial ownership of an organisation. See the help note called Use Consolidation Rate for Multi-Currency or Partial Ownership Consolidations for more details. During consolidations Calxa will attempt to merge account balances from each organisation’s chart of accounts. Merging of balances will only occur where an exact match can be made. An exact match is only present when accounts in each organisation have the same account number, account name and header account structure. When an exact match is made the resulting report will display a single account with the combined balance from each organisation, otherwise separate accounts will be displayed in the resulting reports. As described above, if organisations do not have the same chart of accounts, then the accounts will not merge in the resulting report. Using Account Trees however can help to merge organisations with different accounts to a common header structure. In order to ensure your Account Trees have the same header structure in all organisations, Calxa allows you to copy an Account Tree from another organisation. To copy an Account Tree from one organisation to another, you will need to be in the Account Trees section. Change the Organisation to the one you want as the destination. Click on the drop-down button next to the yellow-star-button, hover over Create New and click on Copy from other organisation. In the dialog box, simply select the source Organisation for the Account Tree and click on the checkbox for the Account Tree you wish to copy over. Click on the Copy button to copy the Account Tree from the source organisation. Note: Identical accounts will be automatically matched to the same headings but you’ll need to manually allocate any others. Select the Reports button from the Calxa ribbon. 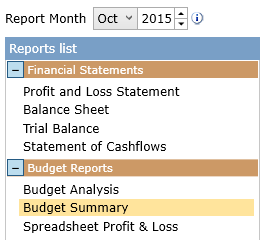 Select an appropriate report from the Reports List (in this example we will be running the Budget Summary report). In the Report Criteria column, tick on the checkbox next to Multiple Organisations. With the Multiple Organisations checkbox selected, you are then able to select the organisations you wish to be included in your consolidation. To do this, simply click on the checkbox next to the appropriate organisations. Note: The Compare budget versions option will enable two budget version templates. The Show Accounts checkbox must be selected in order to display the Profit and Loss statement. When not selected only a KPI report will be displayed. Budget Source: While the consolidated report is only available at the organisation level the budgets may be sourced by consolidating your Business Unit budgets. Select either Organisation Budget, Consolidated Department or Consolidated Projects for each organisation. Accounts Tree: If you have a specific account tree already created for an organisation in Calxa, you are able to use it in the consolidated multiple organisation report. 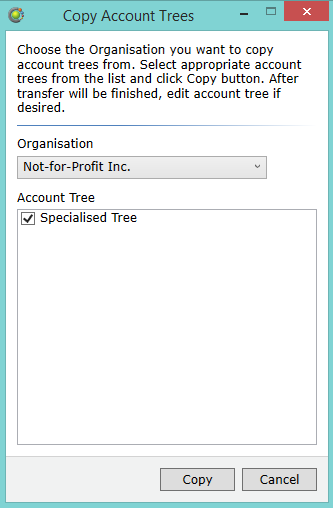 You can choose to include different account trees from each selected organisation if you wish. Budget version: This is the budget version that the budget figures for the report will come from. 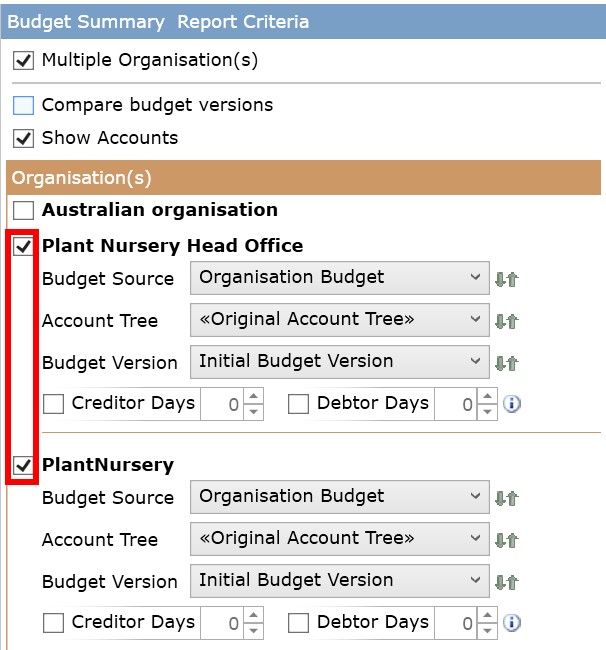 Note that you can display different budget versions for each organisation selected. Creditor Days and Debtor Days: If you wish to change and override the creditor and/or debtor days count for the report you may do so here, otherwise you may simply leave it as unchecked. Sync settings buttons: Click the green sync buttons next to the Budget Source, Account Tree, or Budget Version settings in one organisation to copy its selections to all the organisations you are consolidating. You will receive a pop up message warning when it’s not possible to copy across all organisations. Click the Display Report button to display your consolidated report.